Nicknamed the panda bear of lichens due to its rarity, the boreal felt lichen is an ancient and critically endangered species. But, unlike the giant panda, the boreal felt lichen isn’t photogenic. What does this species look like? The boreal felt lichen is blueish-grey and leafy, with curled-up sides that reveal a white underside, and attaches itself to the tree trunks or branches. While it is usually two- to five- centimetres in diameter, it has occasionally been seen to measure up to 12 centimetres in diameter. The species is found in a few pockets of cool, moist coastal areas of Atlantic Canada. Boreal felt lichen is found on NCC properties in Port Joli, Nova Scotia, and the Island of Newfoundland. There are an estimated 15,000 to 20,000 individuals in Newfoundland. In Nova Scotia, it has been reduced to just over 315 individuals and is believed to have been wiped out entirely in New Brunswick. The species also occurs in Alaska. There were boreal felt lichen populations in Norway, but sadly they are now extinct. What is this species’ ecological role? Lichens are one of nature’s most interesting marriages; a tight-knit association between two organisms: fungi and algae. This association is so tight that most of the time neither one can grow or reproduce without the other. Together, they are quite literally better than the sum of their parts. The fungus partner in the relationship benefits by gaining access to food made by the alga through photosynthesis. The alga profits from having a protected place to live within the fungal filaments and increased access to moisture and minerals. But new research published in the journal Science in 2016 suggests that lichens may also include a third organism: a new kind of yeast. While the discovery still needs to be explored further, it underscores just how fascinating lichens are. The boreal felt lichen provides a valuable source of nitrogen for forests. The species is also proving to be incredibly valuable as an indicator of air quality and climate change. What threats does it face? 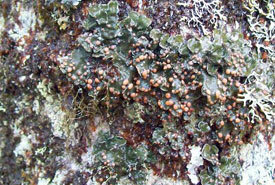 Lichens rely on airborne nutrients and water, and are incredibly sensitive to environmental changes. This sensitivity hurts the boreal felt lichen, especially in Nova Scotia where it has declined by close to 35 per cent over 10 years. 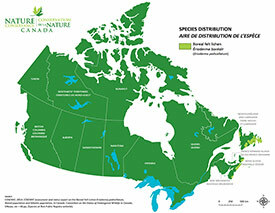 The decline is linked to prevailing winds that bring pollution from central Canada to the eastern U.S., which lands in Nova Scotia as acid rain. Pollution isn’t the only threat; the boreal felt lichen is threatened by logging and is also sensitive to climate change. It is being studied as an indicator species — one that offers an indication of the health of its environment. A recent article in the scientific journal Botany predicted that by 2040 the population of the already-rare boreal felt lichen will be reduced by half. 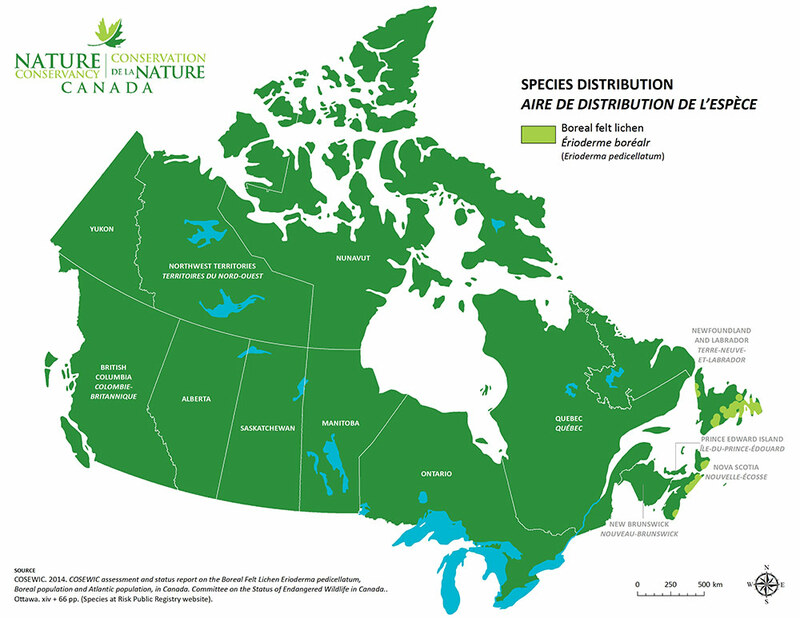 The Committee on the Status of Endangered Wildlife in Canada lists the Atlantic population of boreal felt lichen in Nova Scotia and New Brunswick as endangered, while the boreal population in Newfoundland is of special concern. The species is listed as critically endangered by the International Union for Conservation of Nature. What is being done to protect this species’ habitat? Because of the sensitivity of the boreal felt lichen, conservation strategies must go beyond the local. As an example of unsuccessful attempts at conservation, Sweden tried to conserve its boreal felt lichen by protecting the only remaining stand of trees that supported the lichen. A neighbouring private property owner did some clearcutting, which changed the microclimate in the area, and Sweden’s last boreal felt lichen subsequently disappeared. In Canada, the boreal felt lichen is protected under the Species at Risk Act. Like many of the Earth’s species that are threatened with extinction, the boreal felt lichen lacks charisma, and may go gently into the night, doing its vital, but mainly uncelebrated part, right up until it disappears.